Does that mean the Pope is criticizing the Clintons and Obama? They are on record for advocating Trump's policy which is enforcing the law. The Pope must be really mad at Mexico because it is their policy that is causing this. About 20,000 children each year are separated from their parents in the United States because their parents are sent to prison. It has been happening for centuries. But I am glad the Pope is endorsing free market capitalism. Thank you for agreeing with me that it is the liberals who are causing all this. Do you have any questions? I will gladly answer them. This all started when a liberal tweeted a photo of children in a cage thinking it would embarrass Trump and his supporters. It turned out the photo was during the Obama years. Now even more devastating Obama photos are available. It turns out the Pope did criticize the Obama administration. Somehow America, the magazine, neglected this in the article. Is this sloppy reporting? So are the bishops misrepresenting the situation or is there biased reporting going on? My associate at work said "would any sane person go to a country with their kids if they thought the country would take their kids from them." If they did, then it was their fault and the people who encouraged them to do so. She said Obama kept them in cages and kept them wrapped in aluminum foil. Thank you, Pope Francis, for reminding us of what is right. As for Francis' critics, most would struggle to carry his Shoes, either spiritually or intellectually. Agreed. And I am one of those who has sometimes felt a little uncomfortable upon reading some of his off-the-cuff statements and also one of those unworthy to carry his shoes. 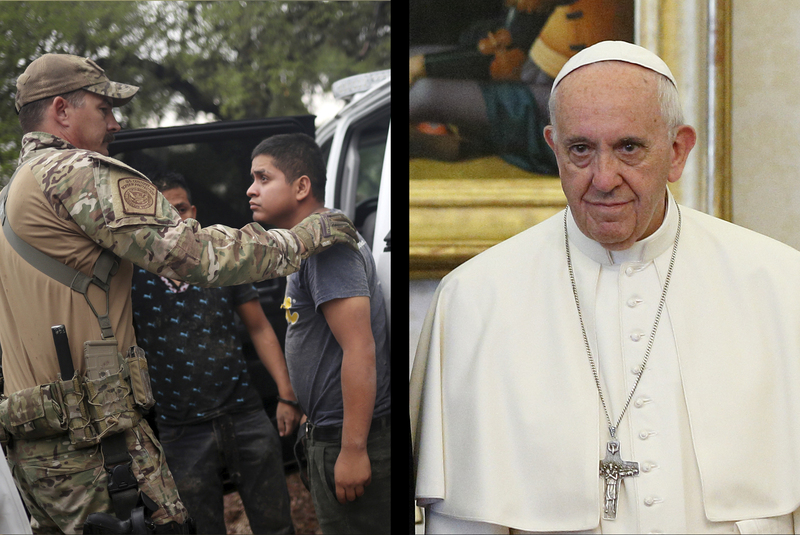 But no one who aspires to be a disciple of Christ should have any problem with the Pope speaking out on behalf of refugees, which is exactly what Jesus himself would do, I think it is safe to say. Of course if Our Lord were here in the flesh today he would probably be mocked and ridiculed by many putative “Christians” who care far more about protecting or enacting their own political/ideological agenda than in assuming care for the poor and vulnerable among us. What is being done and/or advocated in the name of Christ from both ends of the political spectrum is beyond (far beyond) appalling. Well, now that Trump has reversed himself 180°, big surprise, where does that leave the Defenders of Trump? All that argumentation and gaslighting for nothing. Do they feel abandoned when even tbeir Great Leader now agrees with their enemies? I would suggest that when Trump does or says anything, they give it some time to let the fluctuations and magnetic field reversals play out. This is not a guy who thinks things out ahead of time. He flies by the seat of his pants where his brains are. Of course Obama did the same thing and Hillary agreed. There are photos of how Obama put children in football field size cages wrapped in aluminum foil. This whole issue has nothing to do with children. Why the phony outrage now? Oh there is an election coming up. The hypocrisy is amazing.